Whether you have your own rod or are looking for a fully-equipped guided tour, there are plenty of ways to cast a reel in the sparkling waters around Richmond. 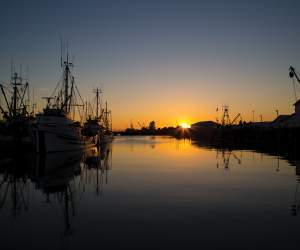 Steveston Seabreeze Adventures offers popular small-group charters from the historic fishing village of Steveston. All the equipment you need for a great day out with regional seafaring experts is provided. You’ll start by checking local crab and prawn traps before heading out to the Southern Gulf Islands for a chance to reel in salmon, lingcod, herring and more. Trips can be tailored to your specific fishing requests. You will need to obtain a fishing license before hopping aboard; click here for more information. If you have your own gear and love setting your own pace, Richmond has five major shoreline fishing locations to consider. They have piers, platforms or floats and they typically offer great Fraser River views as well as the chance to indulge in a tranquil day by the water. Check out these five locations below. You will need to obtain an angling license before you start fishing. Click here for license information and click here for additional information. Imperial Landing - a popular shoreline park in Steveston, with scenic boardwalks and sunset views. No. 2 Road Fishing Pier and Float - an area at the start of the South Dyke Trail with views of Steveston Island (aka Shady Island) and the historic Cannery Channel. No. 3 Road Sports Fishing Pier - a large fishing pier with panoramic views of the Fraser River, Ladner, Mt. Baker and more. No. 7 Road Pier - a restored former barge-loading pier with an open grass area and small beach. Mitchell Island Pier - once part of a Vancouver-to-Richmond rail bridge, the old pier provides yesteryear reminders of local industry as well as expansive views across the river to the fringes of Vancouver. Fishing licenses are required to fish from the Fraser River&apos;s edge at all times, including off of any pier, dock or float. For more information on fishing and boating in Richmond, visit the City of Richmond’s website. Take advantage of drop-in schedules and more at Richmond's sport facilities.